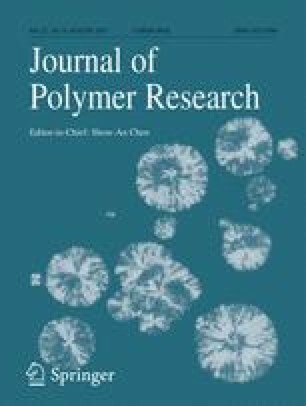 The influence of titania particle size on dielectric properties of ethylene–propylene rubber (EPR) composites was investigated, with an emphasis on the chain dynamics in the interphase region. We hypothesized that a reduction in the conformational entropy of rubber chains in the interphase region would make the restricted chains more prone to orient along the applied electric field and increase dielectric permittivity than the chains in the bulk. The morphology and microstructure of the composites was characterized using scanning electron microscopy and atomic force microscopy, and a notable difference was detected in the average aggregate size and microstructure of the interphase between the nano- and micro-composites. We predicted that the physical attraction between nano- and micro-fillers and polymer, as characterized by the surface energy of fillers, would be similar. However, differences in the chain dynamics investigated by dynamic mechanical thermal analysis and dielectric spectroscopy confirmed the presence of more restricted chains, quantitatively and qualitatively, in the interphase region of the nanocomposites compared to the micro-composites. We concluded that the higher dielectric properties of the nanocomposites could be explained by the lower conformational entropy of chains in these composites compared to those in the micro-composites. The authors would like to thank Dr. Yakup Ulcer from ENPLAST, Turkey, for providing the EPR sample for this research and CEMUC for the AFM characterization.